Wilson Tucker is a fascinating author. Although he wrote several acclaimed SF novels, including the Hugo and Nebula nominee The Year of the Quiet Sun (1970), and was even inducted into The Science Fiction and Fantasy Hall of Fame in 2003, he’s remembered today chiefly for his tireless contributions to fandom. Well, that and his habit of putting his friends into his novels — so much so that the literary term for this practice now bears his name: tuckerization. Truth be told, I probably wouldn’t even know who Wilson Tucker is today if it weren’t for the huge impact he had on modern fandom. But I do know who he is, and as part of my journey through the rich history of our genre, I thought it was high time to try one of his novels. But which one? The post-apocalyptic adventure The Long Loud Silence (1952), which Damon Knight called “phenomenally good… as near perfection as makes no difference”? His famous time-travel novel The Lincoln Hunters (1958), which Stephen King referenced in 11/22/63? His underrated fiction collection, The Best of Wilson Tucker (1982)? I’m kidding, of course. 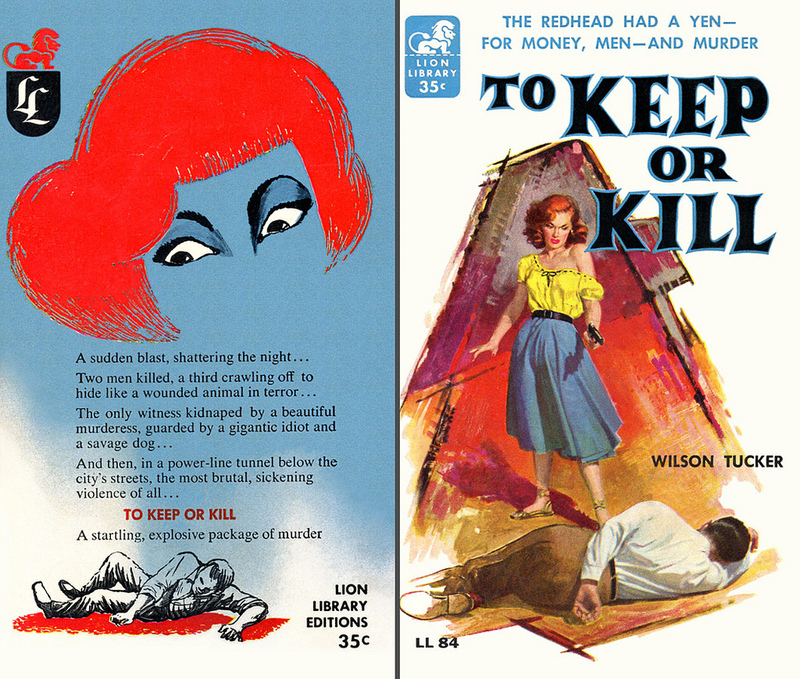 I knew which one I wanted to read the instant I laid eyes on it: To Keep or Kill, Tucker’s second Charles Horne mystery. Horne is a small town detective from Central Illinois who reliably runs afoul of the kind of femme fatales and crooked mobsters that I thought only showed up in L.A, not right here in my home state. A startling, explosive package of murder. 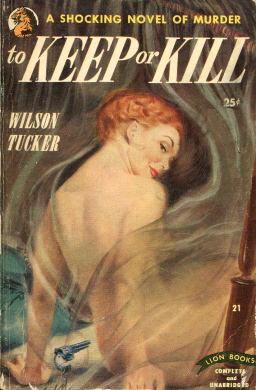 To Keep or Kill was publishing in hardcover in 1947, and reprinted in paperback by Lion in January, 1950. I wish I knew who painted the evocative and gorgeous 1950 paperback. Famed pulp artist Robert Maguire did the colorful Lion Library edition a few years later, but I still prefer this one, which is almost Virgil Finlay-like in its ethereal beauty — and sinister undertones. Like most pulp paperbacks, expect copies to run around the same price as a modern paperback (under 10 bucks). Love the cover! I’ve read The Best of Wilson Tucker, The Year of the Quiet Sun, and Fire and Ice. All of them have been exceptionally good. It’s a shame he isn’t better remembered today. Glad to hear it! I do hear Tucker’s name quite frequently at conventions, but I don’t hear his fiction discussed much any more. Glad to hear he’s still remembered fondly by those who have tried his novels!